In the morning we depart Mojave, California and head south down State Route 14. You can tell how hot the day will be by how the air feels in the early morning as we walk to our vehicles. Today will be hot but not incapacitatingly so. The speed limit is 70 mph on SR 14 and the windows are up to avoid the wind blast. The radio is on but softly as this is the time to sort through the day ahead. The main push is the ongoing careful disassembly of both wing structures. A NASA historian from North Base has asked to come down to where we are at South Base and photograph the Blackbird. Since NASA/Dryden is operating the remaining Blackbirds we want to make sure to accommodate him and see if we can generate any ties with our friends at NASA/Langley. After 14 miles or so the Rosamond Exit off SR 14 appears up on the right This is the exit to Edwards Air Force Base where our SR-71 is parked. Off comes the radio and down comes the window. This road bears north and into Edwards Air Force Base. At 45 miles per hour the open window is bearable and desert smells come in the window. Presently the West Gate guard shack appears and ID is shown. The guards want to know how we're doing with the disassembly, I invite them to come see. More driving and then down a dirt road an onto the abandoned runway where our prize sits. The vehicles park and we get our tools. I get a ladder so I can examine the cockpit. Then I climb in with a a notebook and camera and start documenting what's missing from the cockpits. A U-2 climbs through the morning light and banks away. The early morning finds Peter Merlin, NASA/Dryden's Documentation Archivist, David Allison, webmaster/curator of WWW.HABU.ORG and myself in the scrub brush just off the active runway at Edwards Air Force Base. We are waiting to document NASA's SR-71's takeoff. There is the usual mild frustration as we each have more cameras than we have hands. With some chagrin I notice they have ear protection. Those J-58 engines must be loud! Meanwhile, the normal Edwards traffic of F-16 Vipers, T-38 Talons and F-15 Eagles roar by, often in afterburner. Finally, in the shimmery distance, we see the pencil-thin, side-view of the Blackbird taxiing. As I look up and down the active runway I see other groups with official photo passes and cameras. Even after close to 40 years this aircraft generates excitement among the old hands and the newbies alike. As a pilot I was curious about the preflight checklist of the Blackbird. Torrey Larsen, an SR-71 consultant on our project had a declassified copy which I reviewed the day before. It is very thorough and impressive making the checklists I use look like first grade primers. The Blackbird came to a stop in the runup area framed against the far mountains. The litany of the checklist began and busy hands went through the motions of checking the position of switchs and reading dials while we stood in the ever increasing heat of a new day. A NASA chase F-18 taxiied up and began its own preflight checklist. As is true of all people standing around waiting for things to happen our conversation wandered until it hit upon the subject of snakes. The Blackbird's nickname is "habu" after a poisonous snake found at one of its offshore bases. Soon we were talking about our domestic varieties especially a venomous species of rattlesnakes supposed to inhabit this immediate area. I kept looking gingerly around. A discussion followed on the relative toxicity of snake venom. Suddenly, the NASA F-18 turned around and begins to back taxi down the taxiway. This is not good. Then the Blackbird slowly spins around and back taxis too. An abort! I am crestfallen as I watch it return to its hangar. It never got close enough to photograph. Later, I drove to Lockheed's facility in Palmdale where I heard the problem had been fixed and the Blackbird had launched. Thanks to the cruise control in the van I did not speed on my return to Edwards though some corners were straightened. I got to where our Blackbird was being disassembled and heard NASA's Blackbird was still in the air. There it was! It appeared on the horizon but too small to capture on the digital camera. It glided in soundlessly for a perfect landing. We hoped for touch and goes for photo op purposes but were disappointed. Great progress had been made on our Blackbird however. 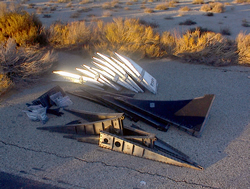 World Wide Aircraft Recovery had carefully disconnected the outer nacelles and wings. Carefully labeled subassemblies and bags of fasteners were neatly arranged near the wings ready to be secured for the night. The time is drawing closer to when a Blackbird will grace and add to our museum's fine collection of notable aircraft. If there is one thing that impresses you out west it has to be the sky. When you look around in Richmond you see buildings and trees. The sky is there but it is like you are looking up from a bucket. Out west on the Great Plains or the high desert the sky goes on forever in every direction. The horizon may be 30 or more miles away and you feel as if you can touch the sky anytime. Today I drove down to Lockheed-Martin's operation in Palmdale which is about 40 minutes south of Edwards Air Force Base. 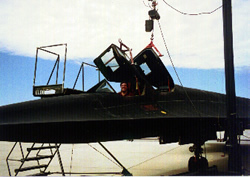 Kent Burns is the Chief Engineer for the SR-71 project and helped us select our Blackbird from the two then available. He is a valuable source of both historical data and the basic housekeeping information we need to keep the Blackbird attractive and authentic. You will notice their are no photographs from Palmdale and that is because a lot of secret work goes on there. Think of the SR-71, the F-117 Stealth Fighter , the new F-22 Raptor fighter and the Joint Strike Fighter. The last two are twenty first century designs and will put our pilots light years ahead of any potential opponents. While it is public knowledge that secret work goes on there security is very tight and justifiably so. 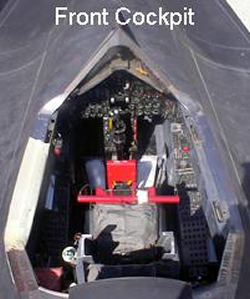 Remember the SR-71 is near 40 years old and still unequalled. Kent Burns and I walked around plant's A-12 and TA-12 which are predecessors to the SR-71A and SR-71B. We discussed the mundane details of securing rudders, elevons, gear wells, etc. From a curatorial view I want to ensure that our Blackbird would weather the outdoors until our capital campaign allows us to put it under cover in the new museum building. As I got ready to go a F-117 Stealth ghosted over our heads into the landing pattern at Palmdale Regional Airport. I was pleased at the contacts established at Lockheed Martin and all the people in the private and public sector who are eager to help us tell the story of the Blackbird and the science behind it. My eyes combed the big sky on the way back to Edwards looking for more exotic aircraft. Another day at Lockheed-Martin/Palmdale, California.. Our Blackbird # 617968 is owned by the United States Air Force Museum but the manufacturer is Lockheed-Martin. Lockheed-Martin is very forthcoming with documentation and exhibitory suggestions. We took another look at Blackbird # 617962 which is going to be loaned to another museum. It too is in excellent shape. I want to see all the Blackbirds I can for comparative purposes before we take our prize home. Again, due to the restricted nature of this area no photography is allowed. Meanwhile, back at Edwards Air Force Base, the steady disassembly of our Blackbird continues. Almost all the panels that need to be removed to access the wing spars have been removed and the neatly labeled grouping of parts continues to grow. If the care and precision of this process seems tedious there is a very real sense of satisfaction among the Worldwide Aircraft Recovery crew of a job being well done. They don't brag about what they are going to do but they do take a very real pride in the recoveries they have already made. Their prior project was the recovery of a C-97. This is a huge four-engine propeller aircraft much larger than the B-29 bomber it is based upon. Besides the pride of doing it right is the unalloyed pride in American aviation history past and present. That is why this trip and the chance to work on a Blackbird are such plums. Many people involved in its history stop by and talk and we hear the history and the science behind it firsthand. Nonetheless, this is a favorite child though and you sense an undercurrent of sadness from the Lockheed-Martin family as one by one these Blackbirds leave the nest for the last time never to return.